Matthew Apgar - mapgar@shawmedia.com Tom Vician, instructor of arts and ceramics, is reflected in a television as he holds up a face mold for participants to see during a clay mask making workshop for military veterans on Saturday, April 11, 2015 at McHenry County College in Crystal Lake. The idea to have veterans participate in an artistic form of self expression stemmed from an article appearing in National Geographic. 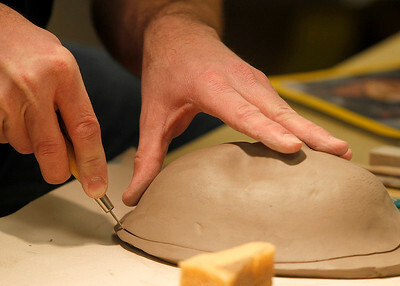 Matthew Apgar - mapgar@shawmedia.com Tom Vician, instructor of arts and ceramics, trims the excess clay from around a face mold during a clay mask making workshop for military veterans on Saturday, April 11, 2015 at McHenry County College in Crystal Lake. The idea to have veterans participate in an artistic form of self expression stemmed from an article appearing in National Geographic. Matthew Apgar - mapgar@shawmedia.com Adam Ruiz, 21, and Andrea Bobadilla, 19, both from Lake in the Hills and veterans of the Army National Guard, use artistic expression to create a face mask made of clay during a clay mask making workshop for military veterans on Saturday, April 11, 2015 at McHenry County College in Crystal Lake. Matthew Apgar - mapgar@shawmedia.com From left: Socorro Medina of Wonder Lake, Jason Memmen of Johnsburg, and Leila Valencia of Woodstock create masks from clay during a clay mask making workshop for military veterans on Saturday, April 11, 2015 at McHenry County College in Crystal Lake. The idea to have veterans participate in an artistic form of self expression stemmed from an article appearing in National Geographic. Medina's sons are in the military, Memmen is in the National Guard, and Valencia is an Army veteran. Tom Vician, instructor of arts and ceramics, is reflected in a television as he holds up a face mold for participants to see during a clay mask making workshop for military veterans on Saturday, April 11, 2015 at McHenry County College in Crystal Lake. The idea to have veterans participate in an artistic form of self expression stemmed from an article appearing in National Geographic.